Tree stump tombstones, generally carved from limestone, were a part of the rustic movement of the mid-nineteenth century which was characterized by designs that were made to look like they were from the country. The gravestones are purposefully designed to look like trees that had been cut and left in the cemetery which was part of the movement to build cemeteries to look like parks. 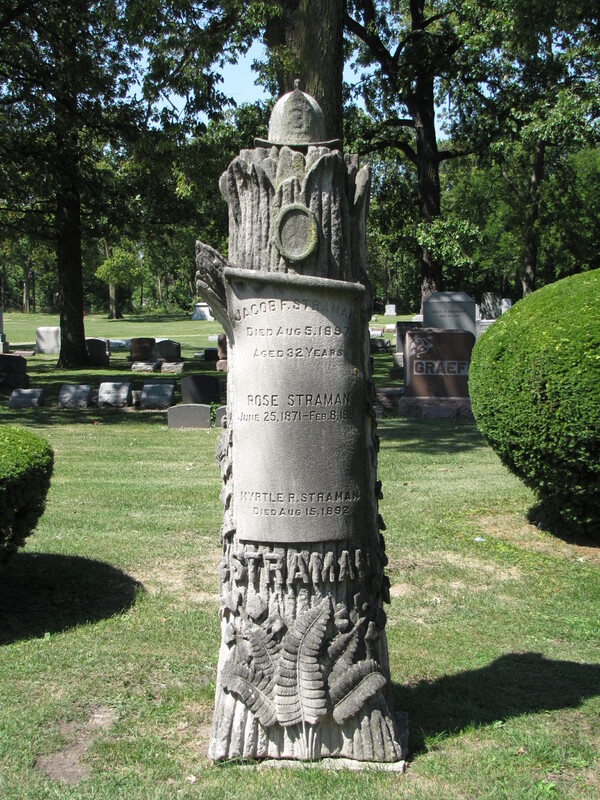 In funerary art, the tree-stump tombstones were varied—the stonecutters displayed a wide variety of carving that often reflected individual tastes and interests of the persons memorialized. The tree-stump gravestones themselves were imbued with symbolism. The short tree stump usually marks the grave of a person who died young—a life that had been “cut” short. In this example, Jacob Straman is just 32 years old. His scroll, which can symbolize the Law or the Word of God, displays his name and birth and death date and the names of two others in his family–Rose and Myrtle. Sitting atop the tree is a fireman’s hat indicating Jacob’s profession but not the entire story. Jacob was killed in the line of duty. He had been called to fight a grain elevator fire. Shortly after he arrived there was an explosion and part of the elevator collapsed, falling on Jacob and trapping him. The other firefighters could not reach him because of the intense fire and he died that night. His ashes were given to his wife, Rose. 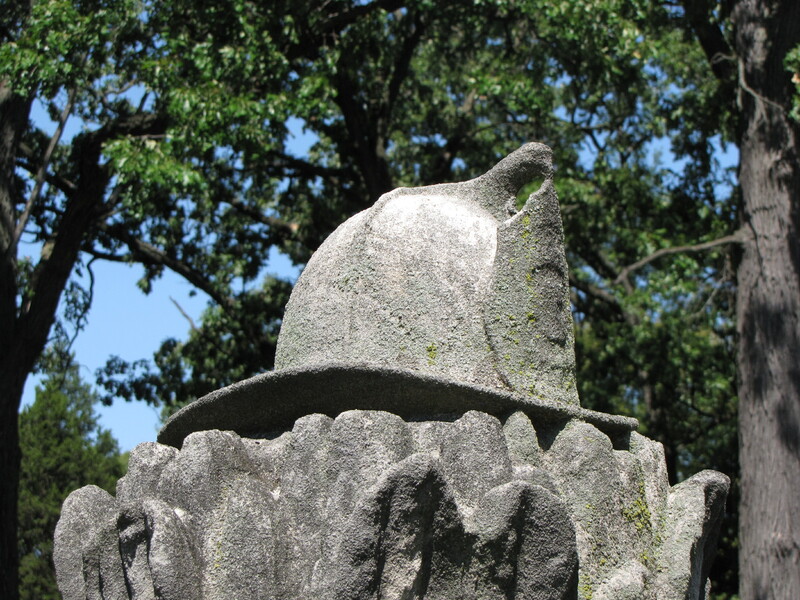 The fireman’s hat commerates Jacob Straman’s service in the fire department and memorializes the life he lost in the line of duty.